A long time ago, in a country far, far away I published a summary of our travels through New Zealand. Clearly a high priority, I’m just now getting around to slinging out the summary for country numero dos. We knew next to nothing about the Philippines when we bought the tickets that would take us there, and we didn’t know a whole lot more when we landed in Manilla. Over a year later and several months after wrapping up our round-the-world trip, the Philippines is always one of the first places mentioned when we’re asked about the highlights of our travels. Unlike New Zealand, there’s no natural backpacker circuit through the Philippines. The archipelago’s seven thousand odd islands are connected by a spider web of ferry routes, and there are about a million ways to get from point A to point B. We spent several hours in Manilla aimlessly flipping through our guide book before somehow deciding to start with a tour through the Visayas, the middle of the three major groups of islands that make up the Philippines. We split our time between three islands: Negros for a few days on the beach, Cebu for SCUBA diving, and more diving in southern Leyte. From there we flew back to Manilla and traveled north by bus, stopping along the way for some surfing in San Juan, good food and caving in Sagada, and a relatively unimpressive visit to the rice terraces around Banaue. The Philippines is easily the best diving destination we’ve ever visited. The reefs around Moalboal and Padre Burgos were healthy, colorful, and swarming with fish. Both spots are dirt cheap. We especially loved Padre Burgos because there were hardly any other divers. Sogod Bay Scuba Resort seemed genuinely committed to conserving the local reef and our dive master was very knowledgeable about the underwater fauna. Swimming with the whale sharks near Padre Burgos was an awesome experience. Looking down on a fish the size of a large car is a sight you don’t soon forget. The food in Sagada was local, fresh, and delicious. 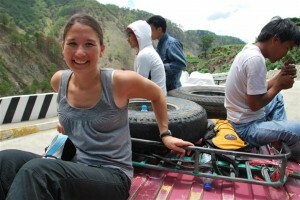 Unfortunately, Sagada is the exception to the rule in the Philippines. See below. Bus rides in the Philippines can be long, cramped, and generally miserable. Many roads are rough and winding. Although Allison and I managed to keep our lunch down, nearly all of the buses along the route to Sagada are streaked with vomit. NO ONE has change in the Philippines. To draw a domestic analogy, picture purchasing some snacks for $2.50. You pay with a $5 note. The shopkeeper asks if you have anything smaller, and when you say that you do not, he runs off to find his brother, cousin, or friend who owns the shop down the street. Five minutes later he returns with a handful of change and two $1 bills that look like they’ve been through the wash and then chewed up by some sort of farm machinery. The accommodation is Banaue is abysmal, and the rice terraces we’d come to see weren’t that impressive. In hindsight we might have skipped our entire trip to the north and spent more time in the Visayas. Unless you like eating chicken and rice with every meal, the food in the Philippines is not that good. Transportation $15.41 Two internal flights make up about half of this category. The remainder is for buses, ferries, and local transport. Accommodation $17.04 We always stayed in private rooms. Food $21.24 All of our food was from restaurants or street vendors. We didn’t cook in the Philippines. Entertainment $30.50 Mostly diving. Also surfboard rental and tours in Sagada and Banaue. Visas $4.71 Free 21 day visas are issued on arrival, but we spent $136.70 to extend our stay. Other $2.74 Internet, laundry, everyday items and cost to ship things home after we decided we’d overpacked. All $91.64 Daily average for all expenses in the Philippines. Philippines total: $2,657.61 over 29 days. Conversion to USD based on 1 USD = 44.33 PHP. The Nomadsforayear.com team would like to recognize Bluefields Hotel in Angeles for having more cockroaches than any other hotel, guest house, or hostel patronized by Jason and Allison during their month-long stay in the Philippines. During two nights at Bluefields Jason and Allison spotted six cockroaches. Four were found in their room and two near the swimming pool. Angeles is a city of approximately 315,000 inhabitants and is located 60 kilometers north of Manila. Angeles is the former site of Clark Air Force Base, which was the largest American base overseas with a permanent population of 15,000. Since its closure in 1991 the base has been redeveloped as the Clark Special Economic Zone, which includes a civilian airport served by several low-cost airlines. Angeles is also home to an impressive selection of gentlemen’s clubs and prostitutes, and Bluefield’s would easily earn recognition for the latter although Nomadsforayear.com offers no formal award in that category. Nomadsforayear.com would also like to recognize George Guest House in Sagada as the runner-up for Most Cockroaches, with four killed during a three night stay. Recognition for Most Cockroaches is awarded with indeterminate frequency. Consideration is given for the size and ferocity of each roach, although the number of roaches is most heavily weighted in the scoring. Like many travelers to Sagada, the next stop on our itinerary was Banaue, a small town about three hours southeast by jeepney. 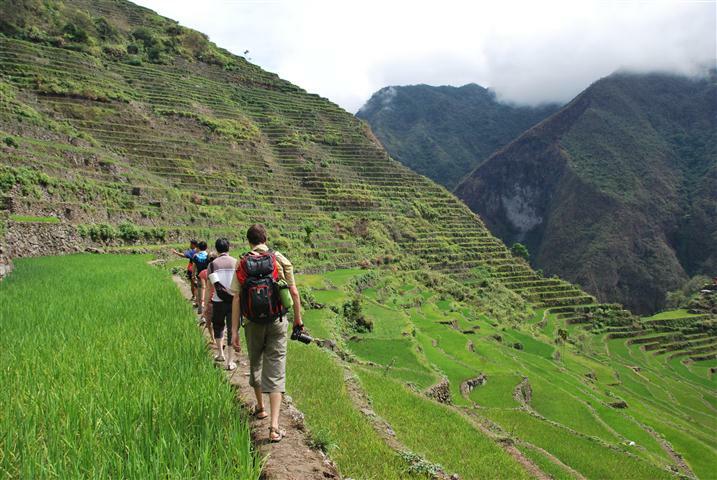 Banaue is famous for its terraced rice fields which are a designated UNESCO World Heritage Site. The ride to Banaue was relatively painless and straightforward. 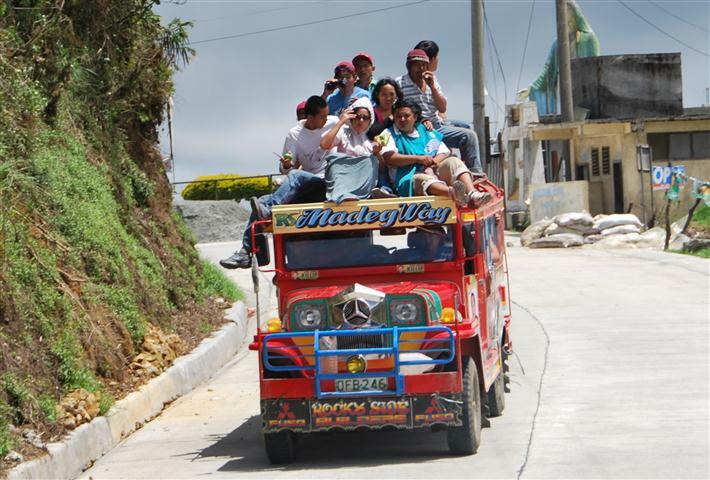 We took one jeepney ride from Sagada to Bontoc and then waited a few hours until there were enough passengers to fill up the jeepney going to Banaue. Once enough passengers were sitting around, the driver shouted something in Filipino and everyone sprang into action. We followed the lead of the locals and climbed on top of the jeepney’s roof. In addition to avoiding the cramped interior, we were rewarded with magnificent views of the countryside. Arriving in Banaue, we were immediately approached by a local guide offering a wide variety of tour options. Turned off by his pushy sales pitch, we declined and set off in search of a hotel. We settled for a cheap room that was barely tolerable due to the lack of natural light, lumpy mattress and pillows and a scary bathroom. This was by far the worst hotel of our entire trip but we were hungry and figured we would only be there for one night. Sitting down to a late lunch, the same persistent guide who had approached us earlier strolled into the restaurant and sat down right next to us. This was definitely not a coincidence. Out of the corner of our eyes we saw other guides lurking, anxious to stake their claim on any new arrivals. Avoiding them became somewhat of a challenge during our three days in Banaue. This was no easy feat considering the town is filled with literally hundreds of local guides eager to take tourists trekking. After learning about the different hiking options, Jason and I set our sights on a challenging two day hike through the rice terraces with an overnight stop in a small village. We soon realized this would cost more than we were willing to spend. One option was to split the cost of a guide and transportation with other people so we spent a couple of hours wandering in and out of restaurants and hotels, proposing the itinerary to anyone who looked like a foreigner. Banaue is not a big place and it wouldn’t be unreasonable to say that we spoke with a large percentage of the town’s foreign tourists that day. Despite our best efforts, everyone we met was either on their way out of town or had already hired a guide for a one day trek. As the restaurants began closing for the night, our chances of finding people decreased and we decided it was time to move forward with Plan B: a one day hike with a group of Japanese and French people we’d met earlier. We made plans to meet at 7 am the next morning. Thanks to our early start we were rewarded with cooler temperatures at the beginning of the hike. Of course this didn’t last long and the temperatures increased significantly as the day stretched on. The heat combined with the steep terrain made for some difficult hiking but the views along the way were beautiful. Our hike took us through Batad, a small village which is completely surrounded by rice terraces in the shape of an amphitheatre. 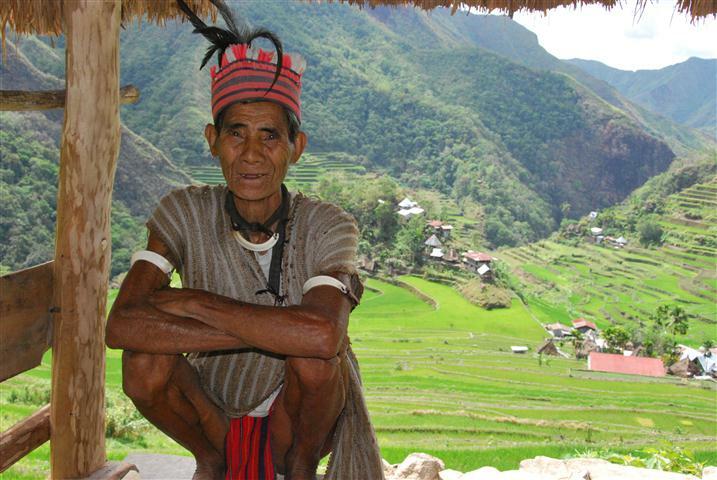 No roads reach Batad, so when villagers need supplies they hike about one hour uphill to catch a jeepney into Banaue. As we were trudging up this hill, two locals flew by in the opposite direction carrying heavy wooden beams used for construction. It was impressive to think that everything in their village had been built with supplies carried in on foot. There’s not much to do in Banaue other than admire the rice terraces so the next day we hired another guide to take us on a different hike. We had been approached by this guide on our first night in town and he projected a much better vibe than many of the others we spoke with. Hiring him turned out to be an excellent decision as he was very knowledgeable and was able to answer our endless stream of questions about the local area and Filipino culture. Throughout the course of the day, we also learned about our guide’s dream of becoming a police officer. He had gone to college for two years but dropped out because his family could not afford to send both him and his two siblings. The money he earned as a guide was being used to pay for their college education. If all went well, they would graduate and find good jobs so that he could afford to return to college and finish his degree. Filipino culture places a lot of emphasis on family and this wasn’t the first time we had seen evidence of strong family ties. This hike wasn’t as strenuous as the first one but it was challenging in other ways. Many of the paths we walked on were quite narrow and some dropped off steeply on one side. Balance has never been my strength and I did slip into the rice fields a couple of times. Fortunately, I never fell far but I think our guide was a little worried about me because he insisted I use his walking stick in addition to mine. After two days of hiking around Banaue we were ready to move on. Besides, we were flying to Malaysia in a couple of days and needed to make our way to the airport in Angeles. We breathed a small sigh of relief knowing this would be our final long distance bus ride in the Philippines.